It’s been a little while since I just blogged about life. Mostly it’s been about games or movies or movies about games, or games based on movies about games. Or books. Or games based on books. You get the idea. We tend to do a little bit of travelling around this time of year, up to the North East to see my family and down to the South Coast to see Grete’s. In terms of distance there’s not much in it either way, 160 miles North East and 200 miles to the South Coast. Okay, so there’s 40 miles more going south. But those 40 miles make a hell of a difference, because most of them are around the M25. In fact, I reckon it’s about ~45 miles around the M25 from the M1 junction we arrive on, to the M23 junction we leave via. It’s only 20-30 miles more going around than it would be going across London as the crow flies, but those miles are often the most painful. This time we went north twice, and each time went up and came back on the same day, it’s about 3-4 hours depending on traffic and stops, and it’s a pretty easy run (especially for me, since I can’t drive). Going south has traditionally been our nemesis though. We once missed a wedding while we sat on the M1 and then the M25 for about 5 hours and only just made it for the reception. The M1 is usually okay, but the M25 is often slow, busy, and inexplicably stop-starty (it might not be a word, but you know what it means). Sometimes we’ll chug along at 15mph for ages, and then speed up with never any sign of what’s going on. Once we got going again everything was clear and other than a minor issue on a local road (sheet ice, preventing us from making it up a hill three times before we found another route), we got there fine. Pretty cold the whole way, made it to minus 7 Celsius at one stage. It’s always worth the journey of course, both North and South. Grete’s mum made a lovely roast dinner for us when we finally arrived, and we got to see her sister and their kids, some friends of ours in Hailsham, and my mother, sister and kids when we went North. But now we’re home. It’s still bloody cold and we’ve had (well, once again, Grete’s had) a hectic day, but it should be calmer now on the run up to Christmas. Some quick shopping today, then a physiotherapy appointment for Grete (the first to see if they can work out what’s up with her back), then Grete taking Fizz to the vets to see why she’s lost her meow, and finally Grete went to the gym. While she was out I quickly tidied, put our Christmas decorations and lights up and sorted out some stuff I’d been meaning to do for ages (recycled about seven hundred free newspapers). Already three days of my holiday gone, but the next few should be nice and relaxing. No work for me today (or tomorrow, or Friday). Yay. Grete’s dad has headed out, so the cat are now trying to work out if the house is safe or not. Bubbles is pretty confident the coast is clear but Fizz is going to take a lot more convincing, and I have the bleeding fingers, wrists and thighs to prove it. However, since I now have no more responsibility until I go back to work I am officially on holiday. Had a really good evening today, went out for food with Grete to a local pub, ate far too much including some awesome cheesecake which I’m really not supposed to eat, and then went over and saw Simes and Marie and dropped off their Christmas present and stayed for a good long chat. All very relaxing and enjoyable. Two more days of work then holiday! 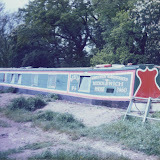 Took these photo’s on a narrowboat holiday in 1988 sometime in the mid-to-late 80’s. I think we started near Leek and went through Stoke on Trent and down to Stratford, but we may have gone north to Manchester, I can’t remember. And yeh, I took a pretty shoddy photo even in those days, I didn’t get any better either. And no, I’m not in any of the photographs, sorry. Edit: The more I think about this the more I think it must have been earlier than 88? The photo’s are still in their original packet, which is clearly marked 1988. But I wonder how long I had the film before getting it developed. I left school in 1989 after two years in the sixth form, which would mean I started sixth form in September 1987. I’m 99% sure I went on this holiday long before sixth form, which would mean either early ’87 or even maybe ’86 but I can’t explain why the date on the photo packet is so out unless it’s from a different set of photo’s?